This kit eliminates an emission control device and is therefore legal for off-highway use only. Furthermore, a check engine light will be present when the OEM TGV’s are removed. The Radium Engineering tumble generator valve (TGV) delete kit replaces the OEM TGVs on the Subaru FA20DIT engine found in the 2015+ Subaru WRX and 2014+ Forester XT. This eliminates the restrictive butterfly valves in the intake runners for optimal flow. 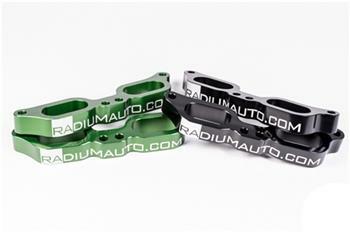 The parts are compatible with the factory O-ring sealed manifold, so no gaskets are required. The kit is a direct bolt-on and requires no permanent modification to the vehicle. A retune is required to take full advantage of the TGV deletes.